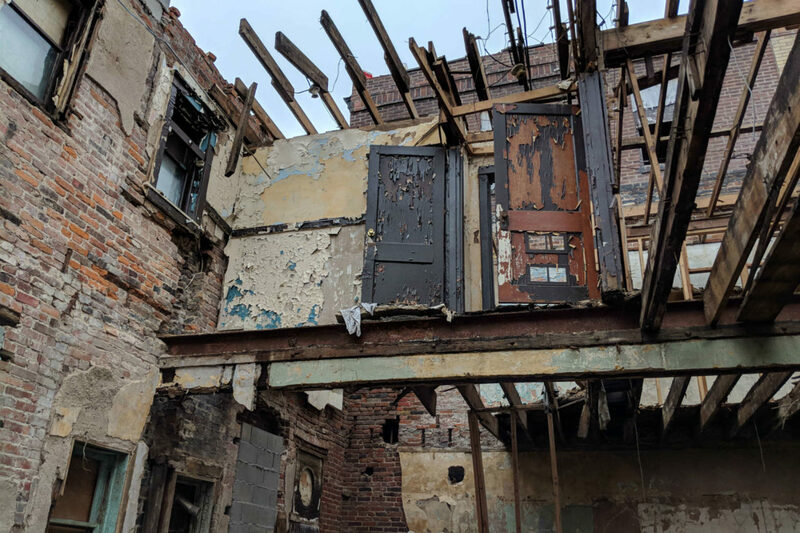 Built in 1922, 2755 Chippewa has endured a tumultuous past. 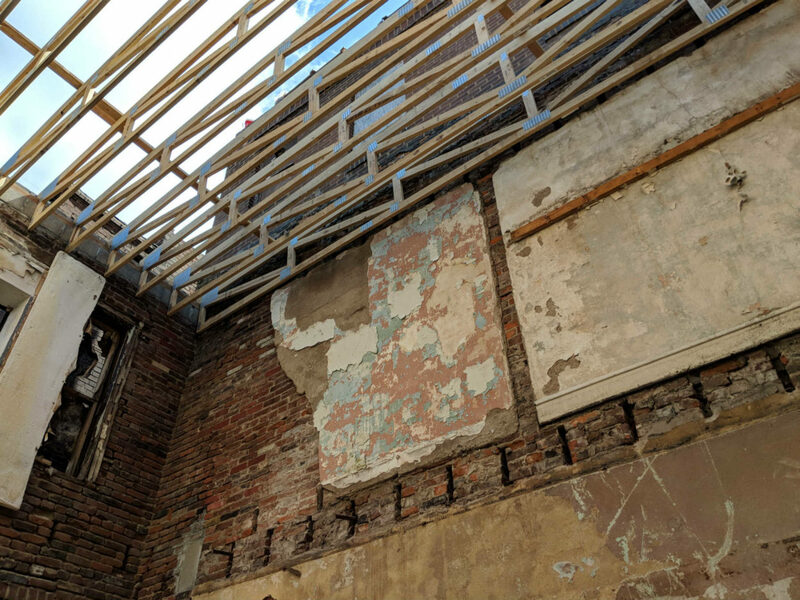 Vacant for nearly 10 years, the building fell into disrepair; considerable roof damage left the building open to the elements, and years of rain, vandalism, and neglect resulted in a building on the verge of demolition. 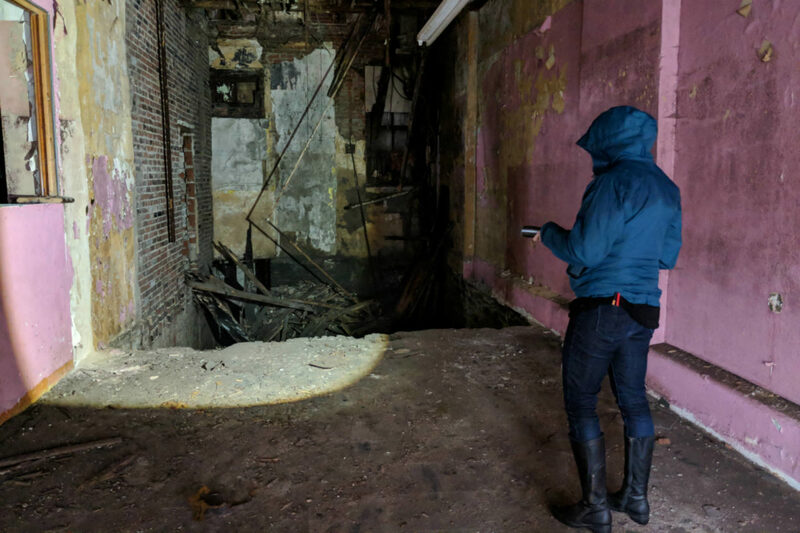 South Side Spaces started planning for the rehabilitation of the building in 2014, and finally acquired it and set plans into motion in late 2017. 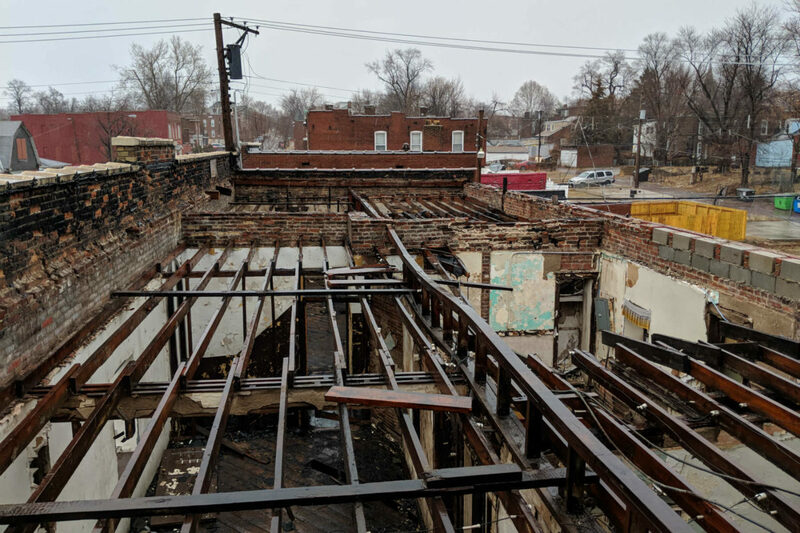 The long road from vacant to vibrant is underway, with plans for 7 residential units and 4 commercial units. Estimated to be completed in spring 2019, the building will add four commercial storefronts to an ever-improving corridor; the neighboring Gooseberries building to the south was renovated within the last 10 years, and construction is similarly underway at the southwest corner of Chippewa & California. These affordable, small-scale retail storefronts will range in size from 300 to 600 square feet and provide much-needed space for burgeoning local businesses. Small storefronts have been in high demand on Cherokee and the immediate area, as a way for businesses to grow and get rooted in the community without breaking the bank. Three of the seven residential units will be rent-restricted, dedicating space for low-income households. One of the units will be street-level and accessible. All of the apartments will feature Energy Star rated appliances, a washer/dryer in each space, and finishes like hardwood floors. Plans call for an access control system at common doors, allowing for ease of access by tenants and guests, as well as interior bike storage on the first level. 2755 Chippewa lies within the confines of the Gravois-Jefferson Streetcar Suburb Historic District. Bounded by Gravois, Grand, Meramec, and Jefferson, this 715-acre triangular area was historically a busy transportation corridor, ferrying wagons, streetcars, and other vehicles through the city. A map of the area shows the streetcar lines as they existed in 1945 – two years before this photo of the intersection at Chippewa & California was taken. The building’s history is fraught with scandal and intrigue. An advertisement from 1933 shows the building listed for sale for $40,000. At the time, the building housed 6 commercial and 5 residential spaces along Chippewa & California. Occupants over the decades included taverns, dress shops, construction companies, beauty supply shops, and more. The longest-standing tenant was Harold’s Tavern, which occupied space in the building at 2755 Chippewa from the 1940s through the 1970s. In 1947, proprietor Harold Plachek was hailed for winning the corkball title for the tavern’s team (corkball, a St. Louis original, was a miniature version of baseball played in alleys as early as 1890). In 1949, Harold Brose, a patron of Harold’s Tavern, was arrested for making “unnecessary noise” by playing a juke box. Just one year later, the building was the site of an alleged lottery press calamity, where Harold Blumenthal was accused of running a $1,300,000-a-year weather lottery ring out of the space at 3746 California. We aren’t sure why everyone was named Harold. 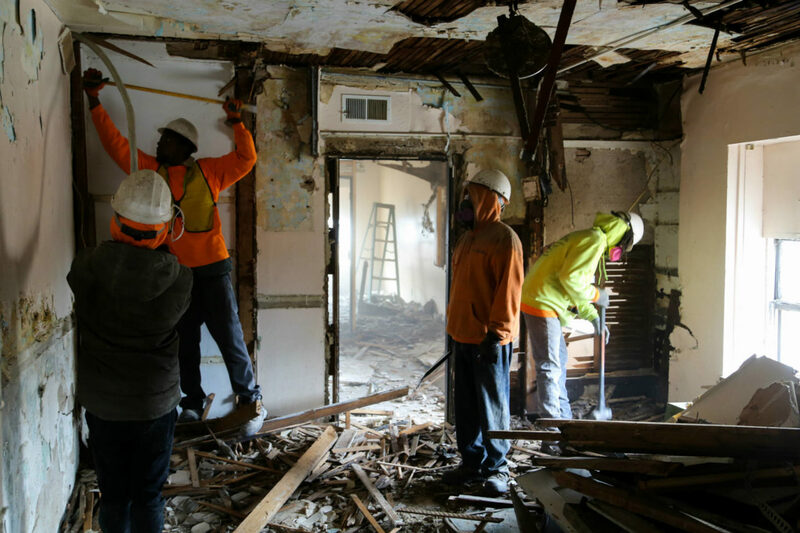 Interior demolition and building stabilization began in February 2018 and was completed in April 2018. 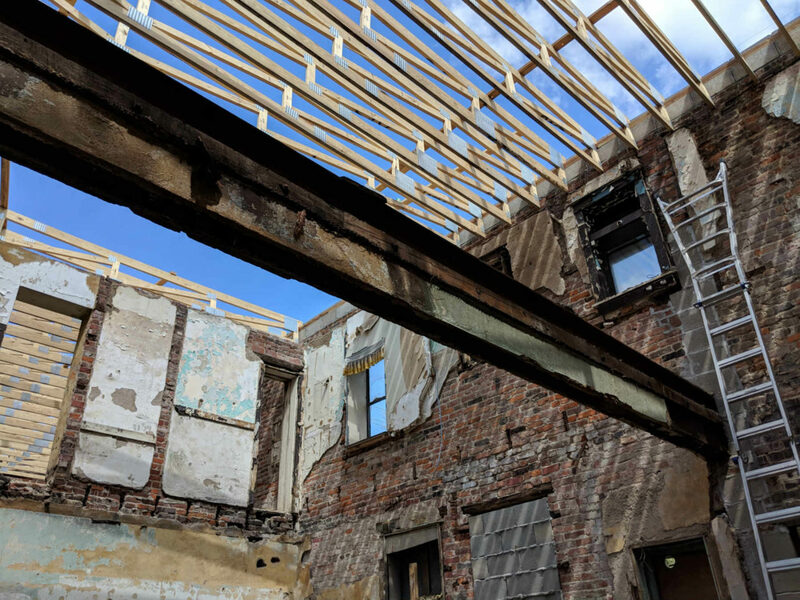 Extensive damage to the building necessitated a new roof complete with truss system, as well as the removal of nearly all interior walls.